The CRUSH Agency was founded on the belief that there's a better place for your brand. We're a full-service marketing and advertising agency dedicated to creating dynamic campaigns from concept to delivery. We love the power of engagement through interactive online marketing– especially when it is supported by comprehensive public relations solutions and media buying plans. 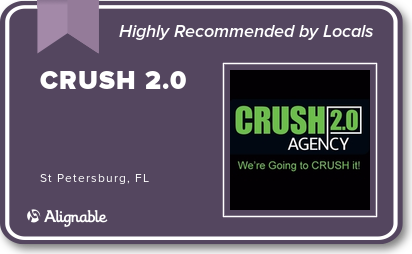 With offices in King of Prussia, Pennsylvania and Tampa, Florida to support the unique needs of clients nationwide, The CRUSH Agency has the digital expertise to grow your brand. We’ve assembled what may appear from the outside to be a curious collection of professionals, but together we possess the ultimate spectrum of experience, vision, specializations, and strongly-founded ideas! We believe the key to a successful business relationship is through a strong foundation between one another. So come get to know us better. Do You Know How to Find Your Prospects? We Do! trends in digital marketing and technology.